St. Peter’s labyrinth was established on August 13, 2010, as a walking meditation. It is a tool that enables us to be still and focus our thoughts and feelings. Labyrinths can be found worldwide and have been used by Christians for hundreds of years as a means of meditation and prayer. Our labyrinth is a smaller replica of the one embedded in the floor of Chartres Cathedral in France which dates back to 1201 CE. You will find our labyrinth on the back side of the property near the Sunday School Cottage and the Buddy Club Garden. St. Peter’s labyrinth is registered with The Labyrinth Society Worldwide Labyrinth Locator. 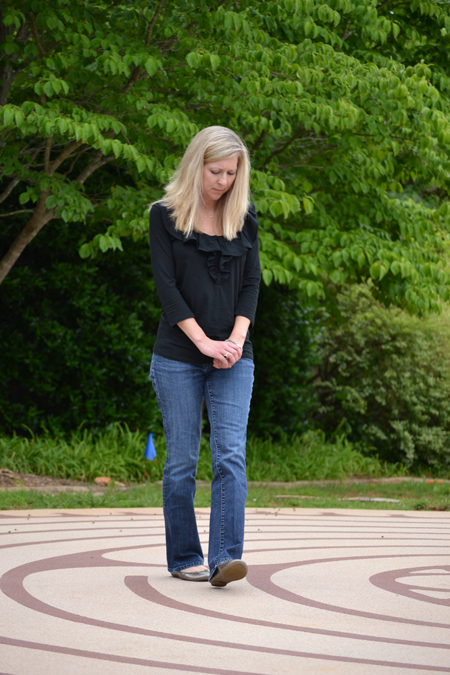 Parish member Chris Weddington is a Veriditas Certified Labyrinth Facilitator. Her extensive training enables St. Peter’s to experience many educational and spiritual opportunities. See the Events Calendar for a listing of labyrinth activities. Why Do People Walk Labyrinths? You are invited to walk our labyrinth at any time.